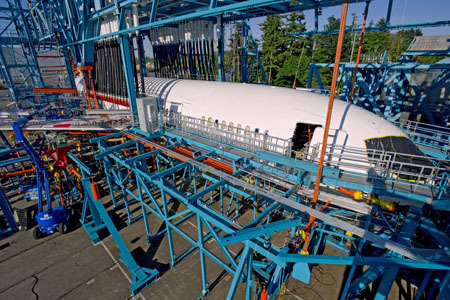 EVERETT, Wash., Sept. 13 /PRNewswire/ -- Boeing (NYSE: BA) has begun fatigue testing on the structural airframe of the 787 Dreamliner at the Everett, Wash., site. Fatigue testing involves placing the 787 test airframe into a test rig that simulates multiple lifecycles to test how the airplane responds over time. "Unlike static tests, where loads are applied to the airplane structure to simulate both normal operation and extreme flight conditions, fatigue testing is a much longer process that simulates up to three times the number of flight cycles an airplane is likely to experience during a lifetime of service," said Jim Ogonowski, structures vice president, Boeing Commercial Airplanes. Video of the fatigue test can be found at http://bit.ly/9zV4jM.